When we bought our 1790 Federal farmhouse almost 5 years ago, the house was in pretty darn good shape structurally but seriously lacking in historical details inside. 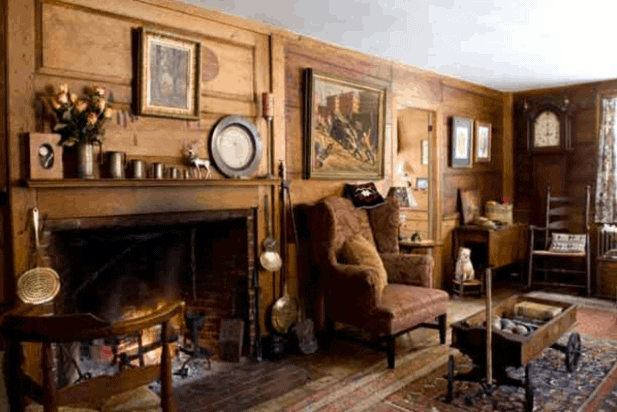 The main house — foyer, library, dining room, and three bedrooms — still had plaster walls, original floors (except carpet in the boys’ rooms), a fireplace, and a Victorian stair banister. Each year, we’ve tackled decorating one room, adding back in some charm. Nothing bigger than adding bookcases was attempted. 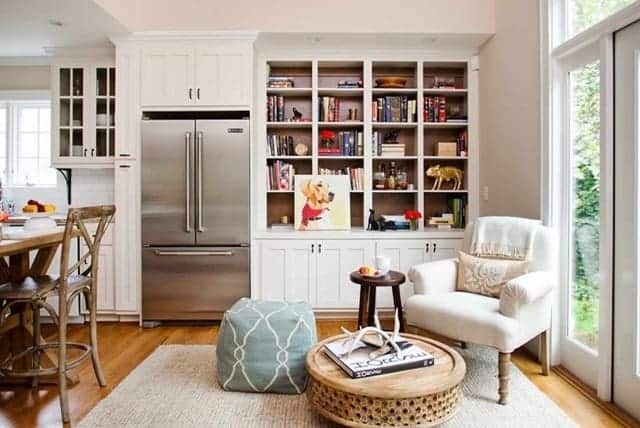 Our biggest qualm with kitchen is that, while it is certainly big in square footage and storage, there is no place for anyone to sit down and relax. The current configuration just doesn’t allow for a sitting area and hearth. 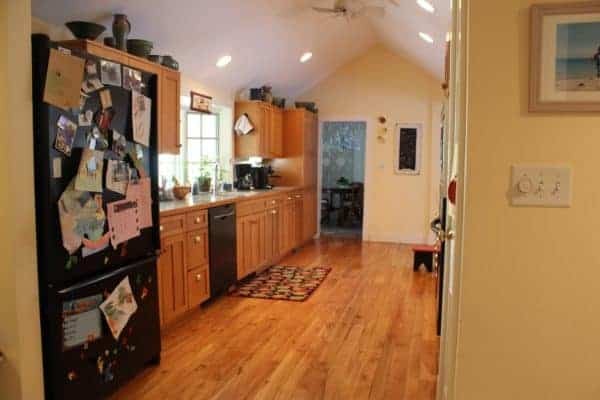 Now, I’ve never wanted an open kitchen/family room. I don’t have anything against an open concept ground floor, but I love having rooms that serve single functions — it makes for cozy spaces, I don’t have to stare at the dirty dishes from the dining room, it great reduces noise in the house, and it’s easier to heat. 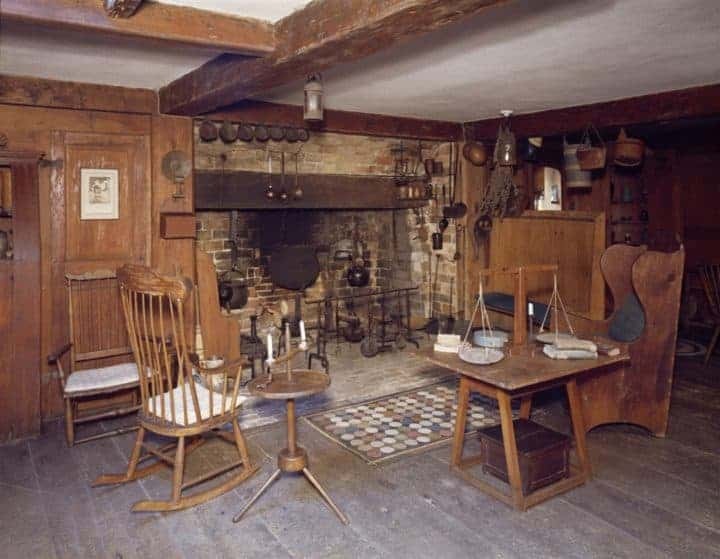 No, I don’t want a family room off the kitchen, but a keeping room would be a lovely thing to have in our old home, and very historically accurate. Ever heard of a keeping room? 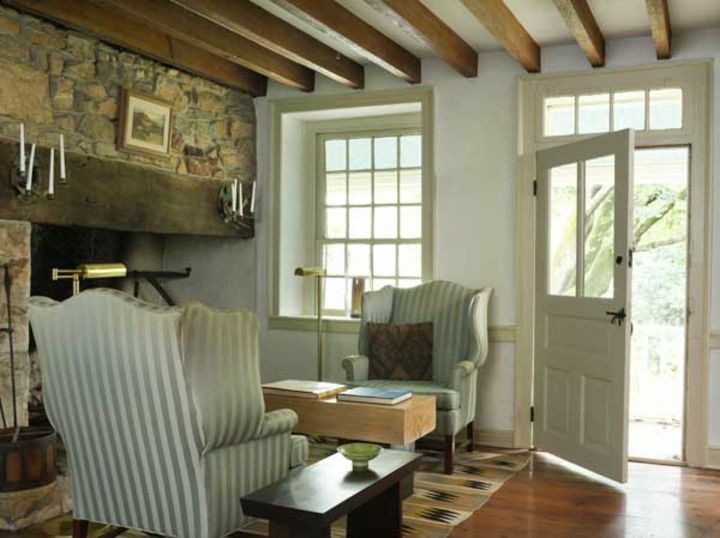 The concept of a keeping room dates back to Colonial times, well before open floor plans. 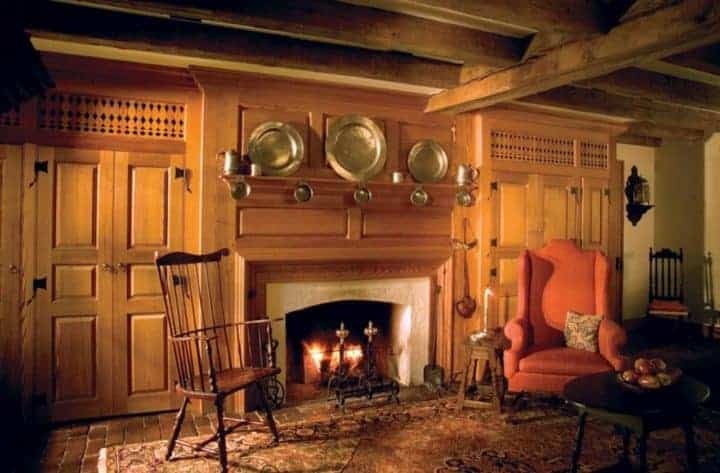 It was a smallish area with seating located directly off the kitchen, which, because of the stove, was also the warmest room in the house. 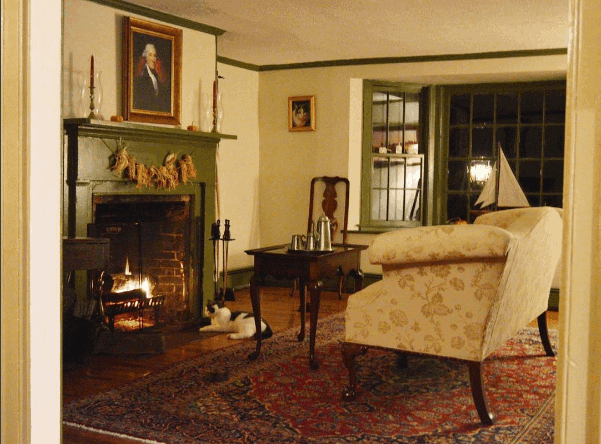 This was the common gathering room usually used for multiple purposes — small chores, reading, socializing, even sleeping, especially in the winter. It was all things cozy. Of course there are many nice, modern keeping rooms. I guess I’ll forgive her the TV. 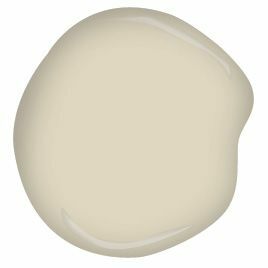 Here are a few that are “historically-inspired” and more in keeping with what I envision for our house. 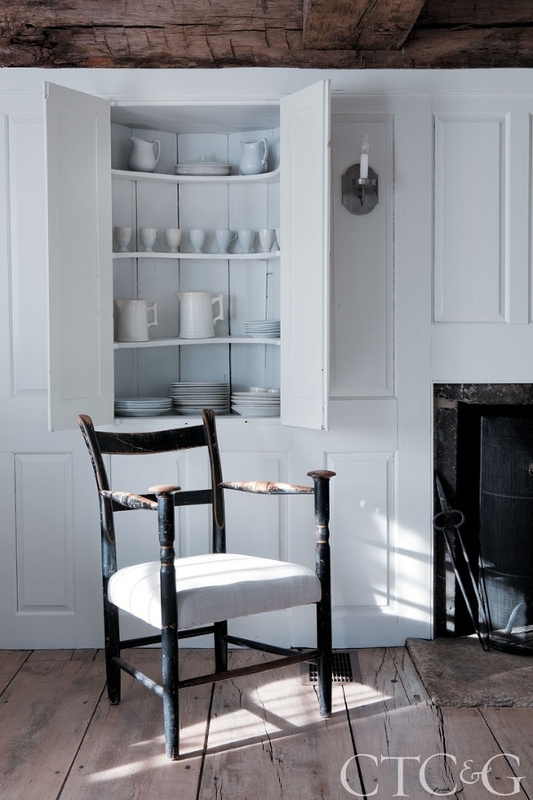 This lovely keeping room belongs to the below kitchen. I LOVE it. 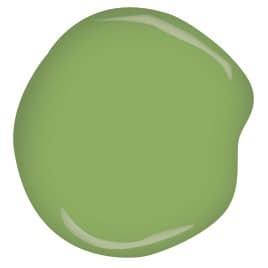 The taupe/grass green combo is acutally what I’m envisioning for our kitchen/pantry. 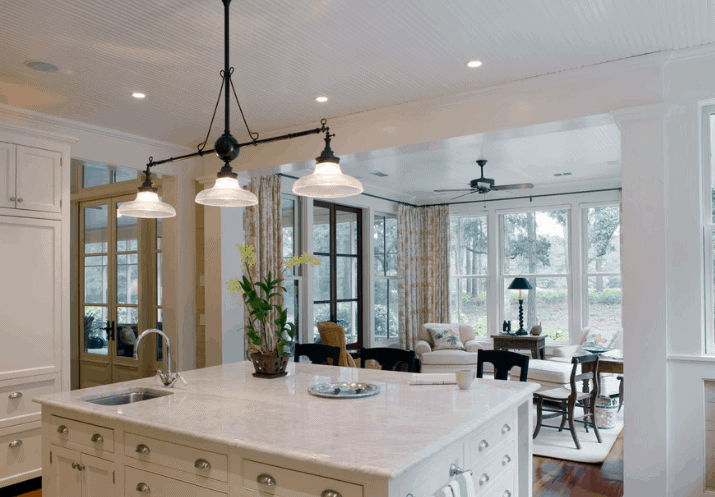 belongs to this gorgeous kitchen. Having a hearth area with a wood-burning stove would actually be really helpful in our kitchen and could be used to heat the downstairs. Yes, many people in New Hampshire still heat their homes with stoves, not just oil or gas. There are a lot of trees up here. Since what I want to do with each space affects the next one in line (e.g. taking away storage in the kitchen means I need to create a real pantry, taking away office space in the kitchen means I need to create an office somewhere else), I always felt it had to be tackled as one, big EXPENSIVE whole that would take us years to save. By the time it got done, Thing 1 would be nearly done with high school! What’s the use of a great kitchen if you can’t enjoy it with your family? I’d known about TMS Architects for a number of years. 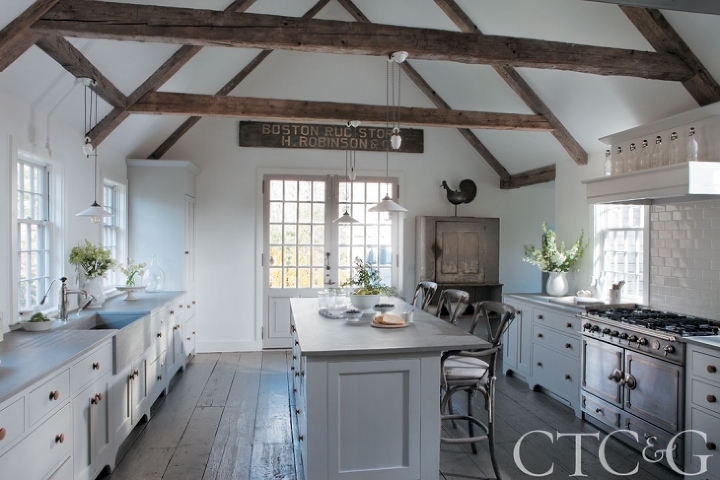 They do very high end new build and historical renovation jobs, and I always see them popping up in Design New England, New England HOME, and other regional design magazines. 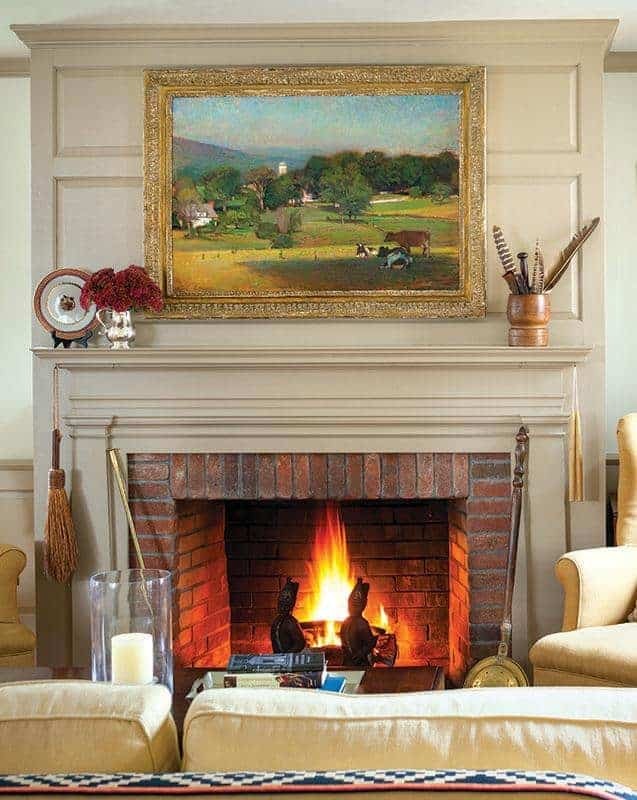 Then, while I was interviewing Principal Architect Shannon Alther for New Hampshire Magazine and the blog about one their latest historical renovation projects (Amazing barn-to-baby-boomer-downsize. Read it here. ), we got to talking about my house. Very kindly, he offered to hoof it to my village and give me his read. Man, it really pays to talk to professionals — even when you are already one yourself! They just have seen so much and have such a vast array of experience from which to draw. Shannon was awesome, and he came up with some ideas I hadn’t thought of previously. 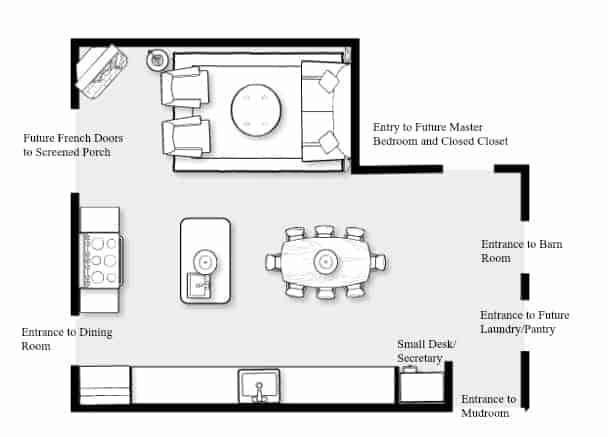 Shrink the square footage of the current kitchen a bit to steal some room for a closet in the future master bedroom. Tackle the project in smaller parts. I can’t believe we hadn’t considered that first. 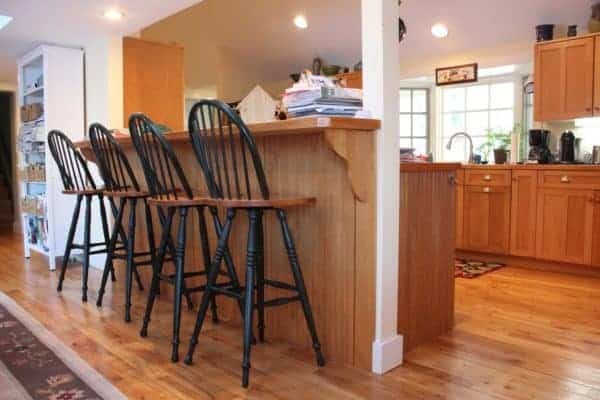 He said to first do the most important to the whole family — the kitchen/mudroom/pantry — in 2-3 years and the rest 2-3 years after that. Temporarily move my office to the empty space created by shrinking the kitchen. This is the current layout of our kitchen area. 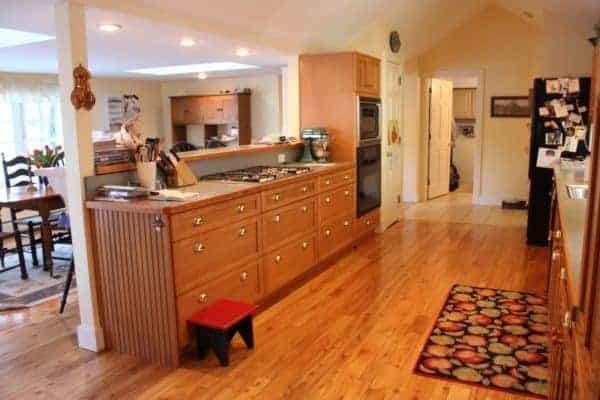 You can see there is a lot of dead space on the left because the island/closet area creates two very long rectangles of the kitchen making it hard to use the space to maximum potential. Notice the white corner in the upper right. That’s where Shannon had his golden idea. Here is our space in reality. It’s full of the hand-me-downs, Home Goods, and hodgepodge that I usually help clients cull, and we’ll discuss the reality and the dream. Ooooo, this feels a little like hanging the family laundry out on a line for the whole neighborhood to see, holes in our “unmentionables” included…. 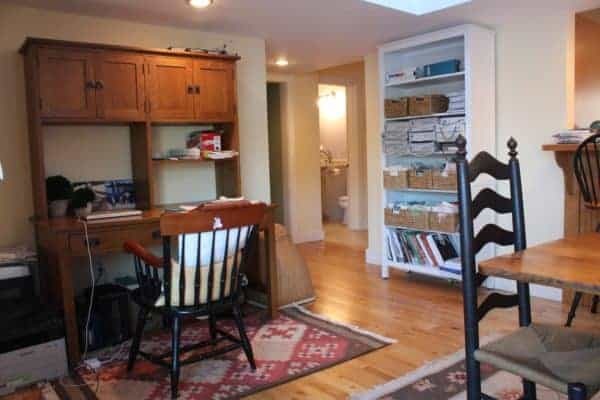 The closet is great and well-used, but I’d love to define this area better, make it a little more “refined farmhouse” — rip out the non-working heater, install slate floors and moldings, and have some functional seating. 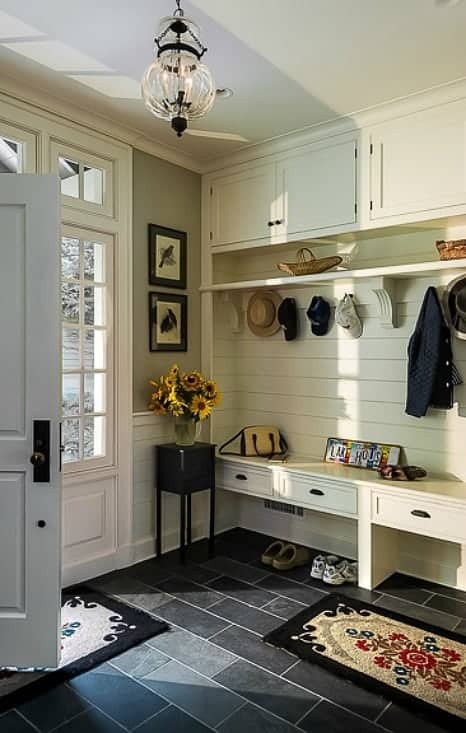 From the mudroom, the laundry room is to the right, tucked into the old barn. 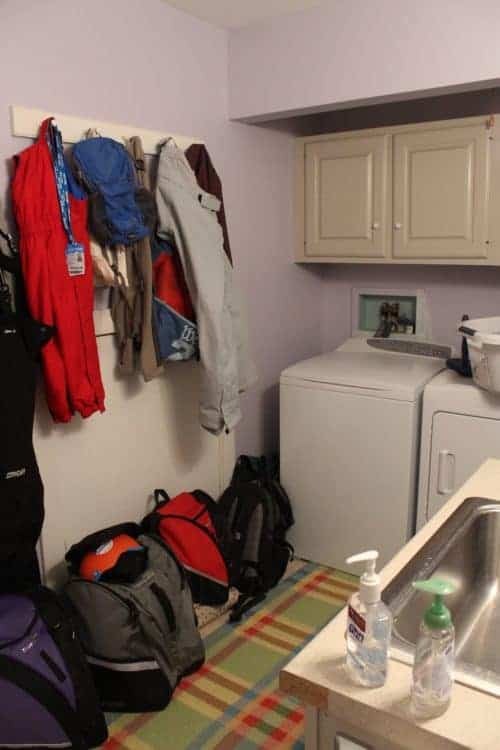 I’m happy to have a laundry room (never had one before this house), but I feel there is so much wasted space in here, as well. There’s a door to under-stair storage beneath the backpacks and coats. It is back-breaking to get into. I think some sort of recessed built-in unit would be more functional. 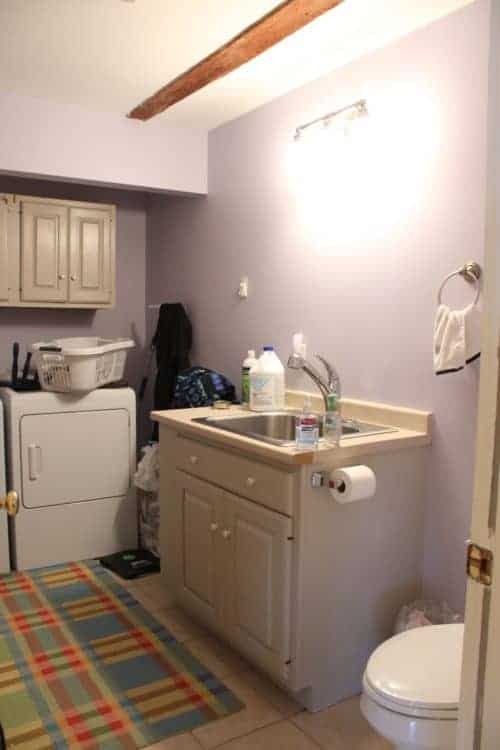 Aren’t the builder’s-reject sink and toilet just glorious?! But you can see an old barn beam on the ceiling. 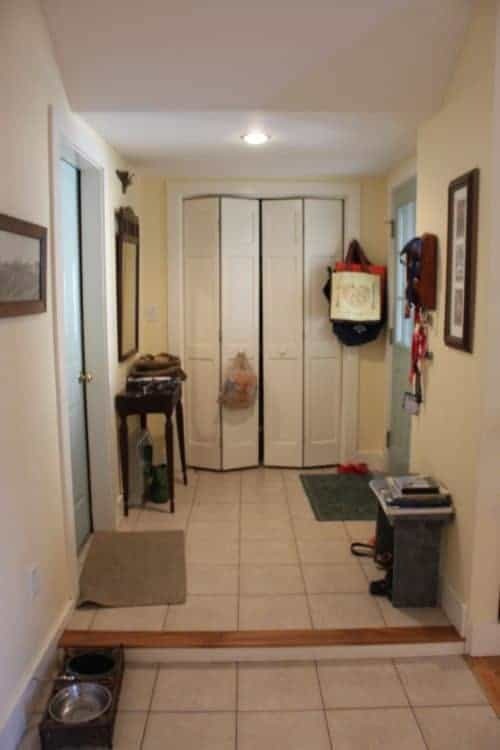 To the left off the mudroom is the kitchen. This is the old ell and is just as old as the rest of the house. 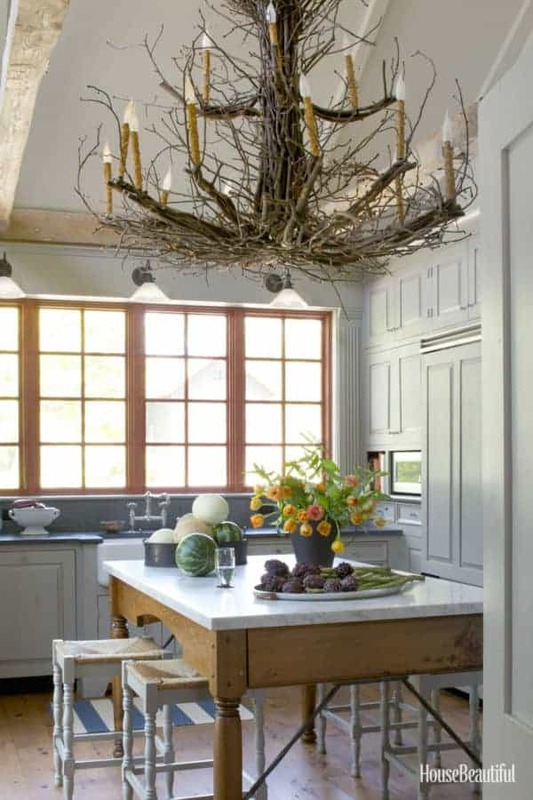 One hundred years ago, it was a combination summer kitchen and woodshed connecting the main house to the barn. 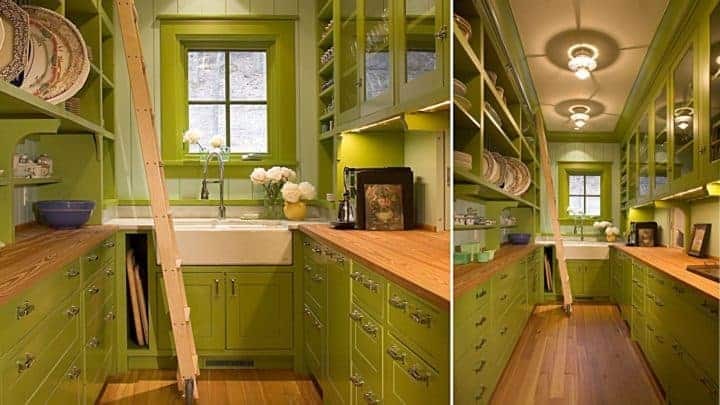 Looks like your average galley kitchen, right? Wrong. 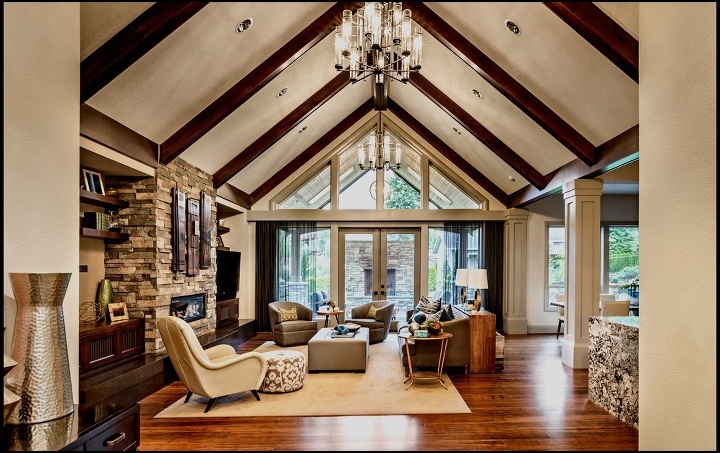 In the 1970s, previous owners bumped it out with whopping 6.5′ ceilings. (They also added a guest room on to the back of the old barn, which we hope someday to make our master bedroom. But that’s another pipe dream.) I’m used to it now, but when we first moved, I felt like the ceiling sat on my head. My dad, who is 6’3″ still feels that way when he visits. The skylights let in nice light, but they also leak, are super dirty, and cause the room to bake in the summer, and I don’t mean cookies. The owners from whom we bought the house renovated the kitchen in 2003, and they loved it. From what they told me, the space you see below was actually 4 rooms before they made a big kitchen. No mean feat. 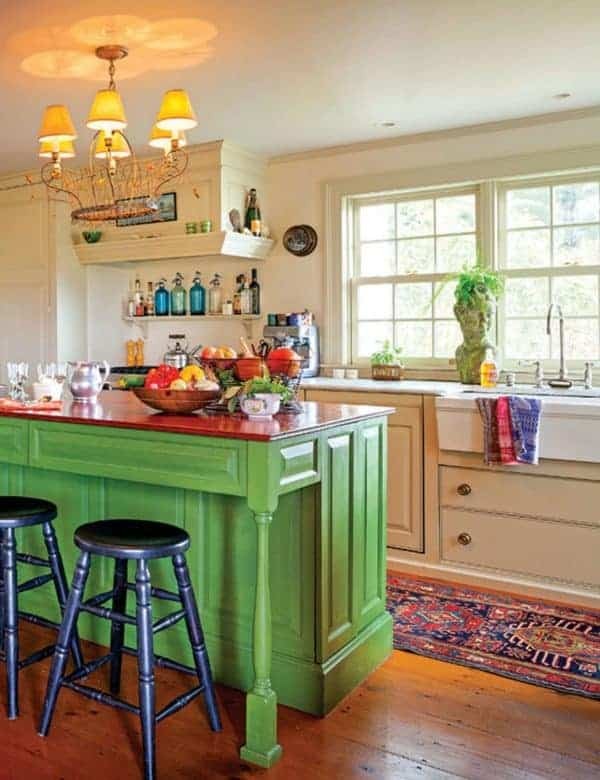 However, I’d like to make it more in the style of the house — consistent floors, raised panel cabinetry, beams in the ceiling (they’re in there somewhere, covered up), cool lighting. Also, I end up walking around the wall oven/closet configuration with the ginormous island about 97 times a day to help the kids at the table. Not the way I want to get my exercise. The light from windows on both sides — especially overlooking the pond — is absolutely wonderful. My growing office. I took this pic about 6 months ago. Now there are two bookcases and boxes of samples on the floor too. The dream is to move out to the little cottage by the driveway, which was a former blacksmith’s shop and currently houses my handsome husband’s weight set and newborn chicks each spring. 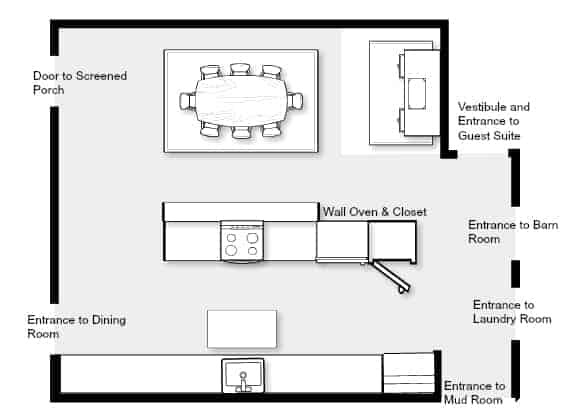 Create the aforementioned pantry/laundry room/bar. Painted raised panel cabinetry in taupe. Counters in a historically-more-appropriate soapstone. Take out whole island in favor of open layout with a marble topped work table or island along side our farm table. Bump up wall to create space behind for a future master closet and add keeping area seating with stove and fireplace surround. 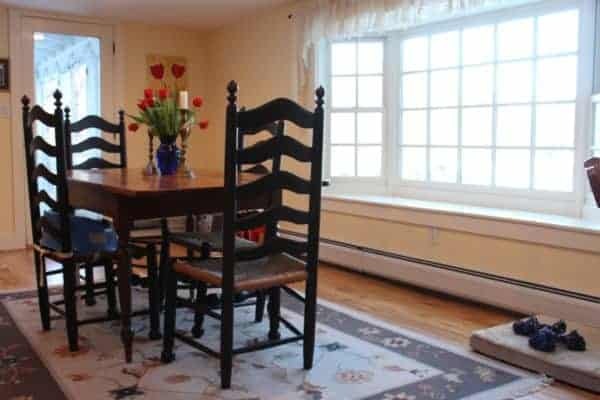 Replace floors with reclaimed flooring to match rest of house or paint current ones. A & H Architecture, not Green Thumb, but you get the idea. Add concealed laundry. So, the goal is 2-3 summers from now! ‘Til then, I’ll be saving my pennies. And dreaming of my keeping room. Wow, I’m very impressed by your plans and the patience to do them in stages. On a much smaller scale, my husband and I are working on some renovations/updates to our 1980’s house that we’ve waited for years to do. In all of the waiting time, my vision for what I wanted has become clearer, and I think fewer mistakes are being made as we go along. 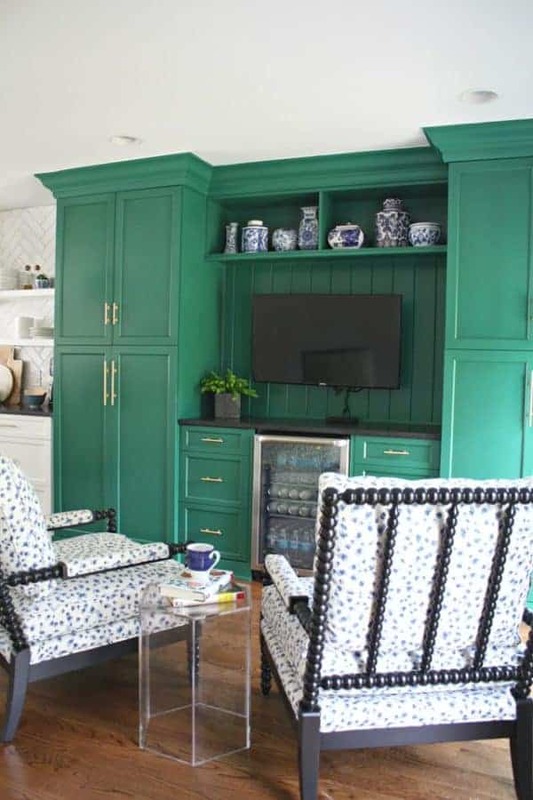 Though I live in Florida, my tastes have always leaned toward colonial style, so the keeping room concept is a favorite of mine. I’m not a fan of the giant open concept that seems to be the rage of the moment. In probably 10 or 15 years, a lot of people are going to be putting walls back up to block out all of the noise! Can’t wait to see how your work progresses, and I love some of your inspiration pictures. By the way, my husband is from Maine, and I love New England. Hi Paula! Thanks for your comments! I agree that, while it’s hard to wait, taking your time and seeing how you live in a space leads to fewer mistakes. I would love to hear about your projects!